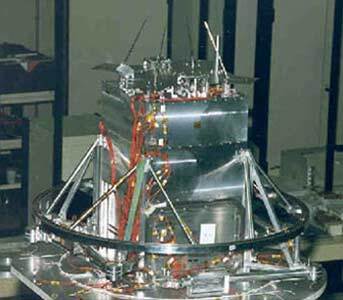 SACI 2 (Satélite Científico 2) is a 60 kg scientific satellite (Scientific Applications Satellite) launched on the 11th December 1999 on the second flight of the Brazilian VLS-1. Failure of the launcher second stage prevented it from reaching orbit. The spacecraft was built by the Brazilian space agency (INPE). The satellite measures 640 × 400 × 400 mm and carries four scientific payloads (PLASMEX, MAGNEX, OCRAS and PHOTO) with a mass of 10 kg in order to investigate plasma bubbles in the geomagnetic field, air glow, and anomalous cosmic radiation fluxes. It also carries various platform technology developments. The spacecraft is spin stabilized. The ground segment is to comprise two main stations with 3.6 m dish, and user ground data collecting stations. The spacecraft employs S-band communications links with a 2W, 256 kbps downlink and 19200 bps uplink. A solid state data recorder with 48MBytes capacity is carried. Its sister spacecraft SACI-1 was launched earlier in 1999. SACI-1 and 2 are reported to have cost approximately US$1.7 each.